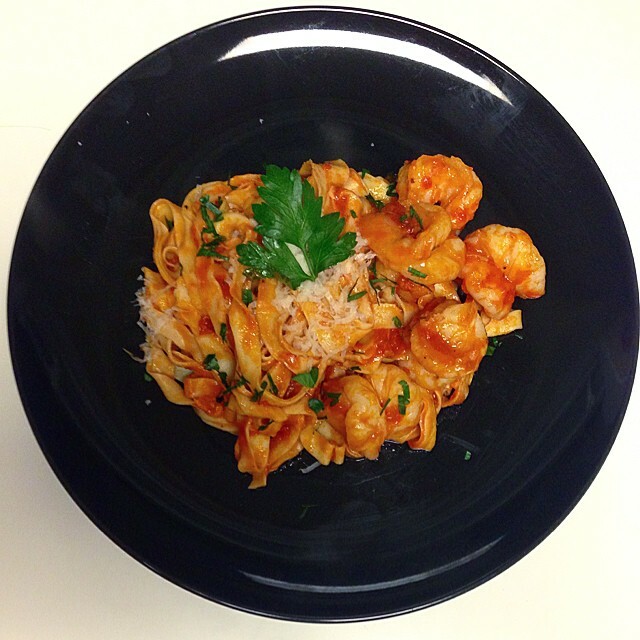 An Old Dish with New Tricks: Shrimp Fra Diavolo with Homemade Pasta! – Pao Says, "Open Wide!" So, I have made shrimp in a spicy tomato sauce with linguine/fettuccine/spaghetti time and time again. But on this Lazy Sunday, I felt the urge to break open my new Kitchenaid Pasta Maker and use my blue babe for the first time. (My Kitchenaid mixer is blue… in case you were wondering). The pasta-making was quite the experience! I have made pasta in the past by actually hand-rolling it (with a wine bottle… I didn’t have a rolling pin, and desperate times call for desperate measures), and let me tell you, the pasta-maker attachment makes it so much quicker and simpler! To make the pasta, I followed the instructions in the manual- I needed eggs, flour (sifted!! ), a pinch of salt, and some olive oil. Technically, the manual told me to add water, but I subbed it for olive oil… I’ve never been one to follow a recipe to the T. All of the ingredients were combined by my mixer using the dough attachment, and once the dough was formed, I kneaded it myself for a few min and then let it rest for about 15-20 minutes. While the dough rested, I filled my giant pot with water, a bit of olive oil, and salt and put it on high heat so it would be boiling by the time I finished rolling and cutting the pasta. I also took this time to take the tails off the shrimp I would be cooking. Shrimp take basically no time to cook- if you’re making this dish with pre-made pasta, it takes like 15 minutes. I cut the pasta dough into 4 equal parts and started putting it through the roller attachment. This is so cool!! I included a video of the actual noodle-cutting. Definitely worth it to get this attachment. When you’re ready to cut the noodles, dust the rolled out pasta sheets with flour and set it through the cutter! All you do then is boil the noodles for 2-4 minutes depending on the thickness. Once the pasta is made, the rest is simple! The only tomato sauces I use/trust were introduced to me by my college roommate. The brand is “Rao’s”- it is a famous Italian restaurant here in NYC, and the sauces are truly awesome. I’ve used the marinara, the Arrabiata, the vodka sauce… honestly I’ve tried almost all of them and I really do love them. So first, I’ll sauté the shrimp in a bit of butter, olive oil, and chopped garlic. Once they’re almost cooked (almost all the way pink), I’ll throw in the Rao’s arrabiata sauce and heat it up. then I toss in the noodles and dinner is served! Garnish with some parsley (if you wanna get fancy) and be generous with the parmesan. always. Proudayou for starting this Pao Pao! And thanks for the credit on the Rao’s. My solo culinary accomplishment. PS the Cuore DiPomodoro flavor is the absolute best – marinara with prosciutto and onions…hard to find, but it’s amazing!